Plans for the 148MW Ross River Solar Farm were first proposed in 2016. Recognising the site’s abundant sunlight and proximity to urban areas where sustainable, renewable electricity was needed, the project’s developers, ESCO Pacific, applied to deliver Townsville’s first large scale solar development. 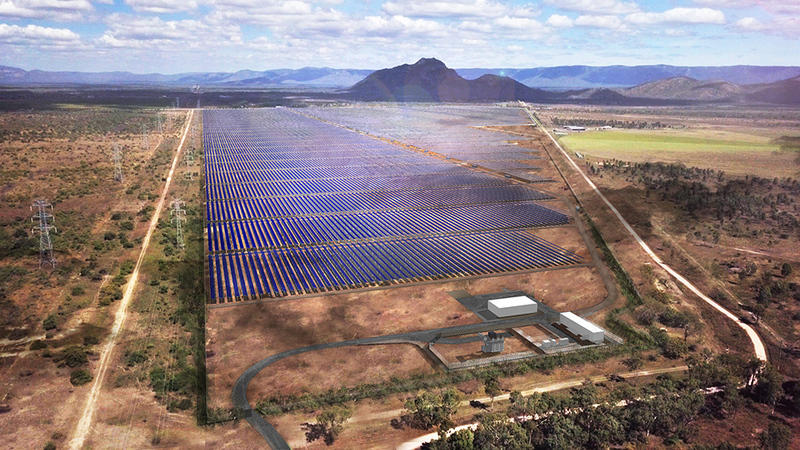 Townsville City Council granted development approval for Ross River Solar Farm in June 2016. In late 2016, it was announced specialist infrastructure managers, Palisade Investment Partners, had become joint owners and project investors in the Ross River Solar project. Palisade then led the process of securing financial close for the solar farm in the second quarter of 2017. Construction is now underway. Downer Utilities has been appointed as the Engineering, Procurement and Construction (EPC) Contractor. Ross River Solar Farm will be built on a 202 hectare site that was historically a disused mango farm. The solar farm will be ‘utility scale’ and have the capacity to generate 148 megawatts of clean renewable energy – enough to power over 54,000 homes. Solar farms use solar panels to capture the energy from sunlight. Ross River Solar Farm will have around 413,000 solar panels installed on single axis tracking systems that allow its panels to rotate and capture a maximum amount of sunlight. Each of the farm’s crystalline solar photovoltaic panels will be identical in type but larger in size to those used on household rooftops throughout Australia. All structures on site – including panels and power inverters – are approved up to a maximum height of three metres. To further reduce the visual appearance of the farm, vegetation buffers will be planted at either end of the site. Physical construction has started and will be completed within 12 months. Ross River Solar Farm is expected to operate for up to 40 years. After this time, the plant will either be refurbished for further use or fully decommissioned, with the site returned to its natural condition. Development Approval for the Ross River Solar Farm was granted by the Townsville City Council in June 2016. See here for copies of the Ross River Solar Farm Planning Report and Decision Notice.